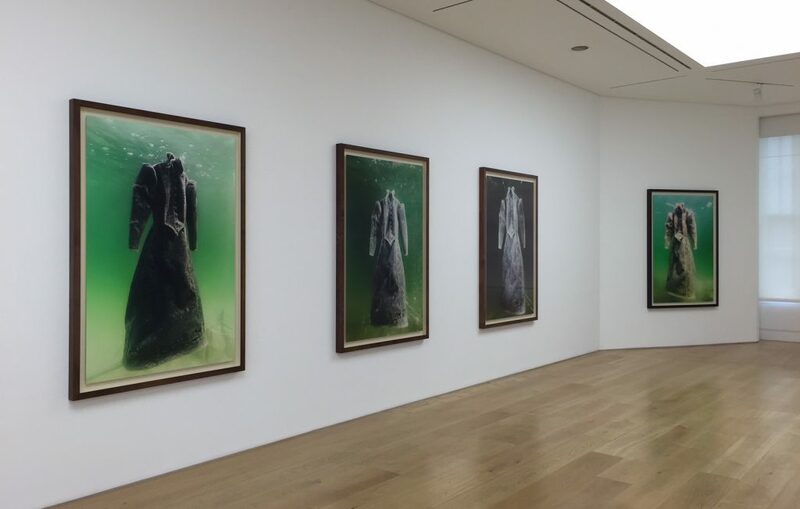 Marlborough Contemporary is pleased to present Salt Bride, a series of eight large colour prints by Sigalit Landau. 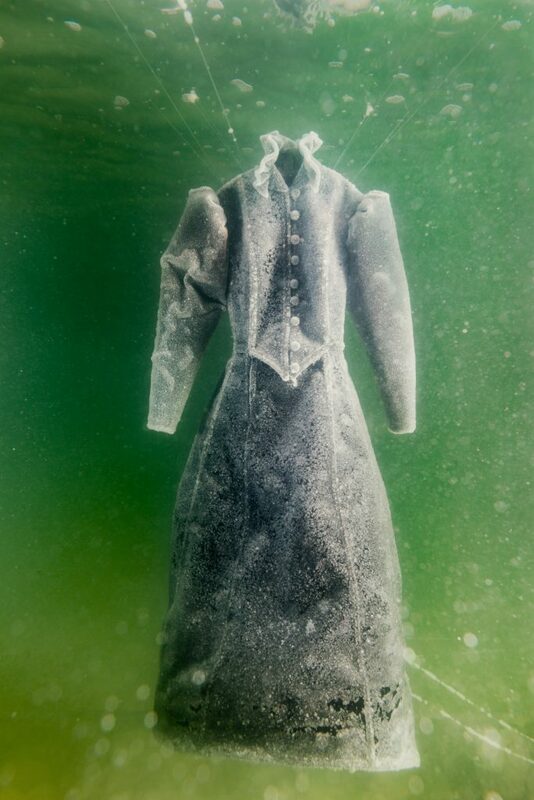 Photographed underwater, working in collaboration with Yotam From, the images document the transformation of a dress submerged in the salt-rich waters of the Dead Sea. The traditional Hasidic garment shown in the photographs is a replica of the costume worn by the female character Leah in the canonical Yiddish play, The Dybbuk, as portrayed by legendary actress Hanna Rovina for forty years with the Habima Theatre, first in Russia and then Israel. Written by S. Ansky between 1913 and 1916, The Dybbuk tells the story of a young bride possessed by an evil spirit and subsequently exorcised. 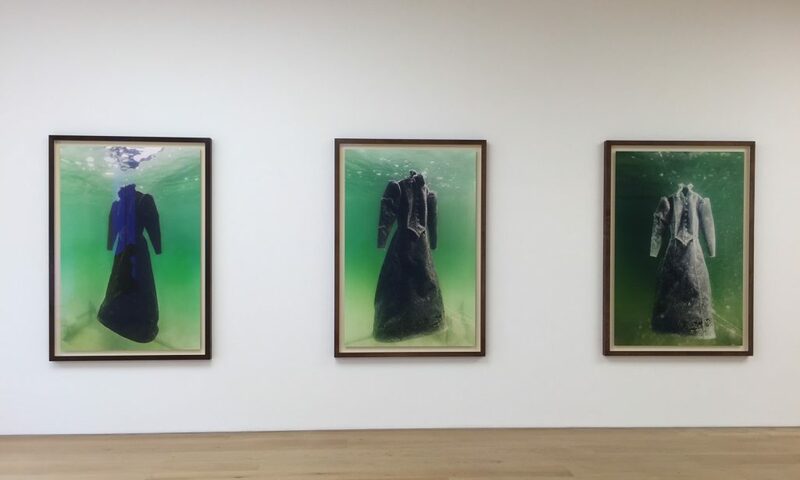 In Landau’s Salt Bride series, Leah’s black garb is transformed underwater as salt crystals gradually adhere to the fabric. 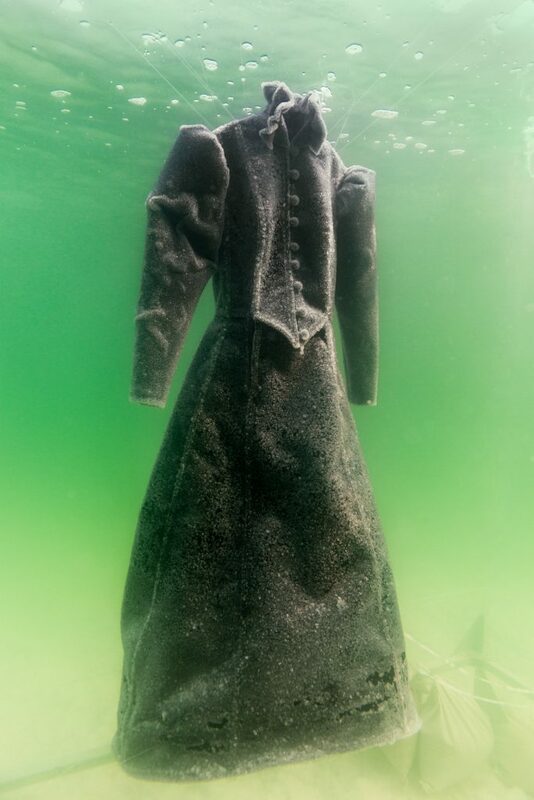 Over time, the sea’s alchemy transforms the plain garment from a symbol associated with death and madness into the wedding dress it was always intended to be. Sigalit Landau, Salt Bride, Exhibition view at Marlborough Contemporary, August 2016. Courtesy of Marlborough Contemporary. 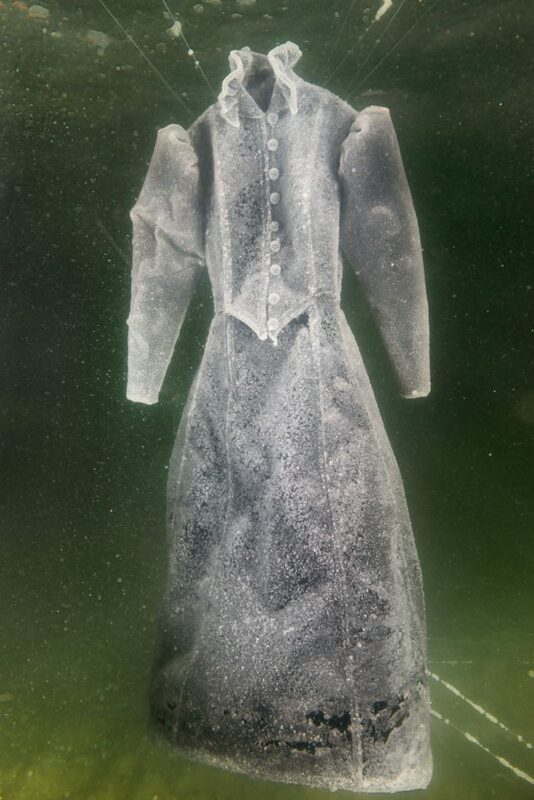 Sigalit Landau, Salt Crystal Bride Gown I, 2014, Colour Print, 163 x 109 cm, Courtesy the artist and Marlborough Contemporary, London. Photo: Studio Sigalit Landau. 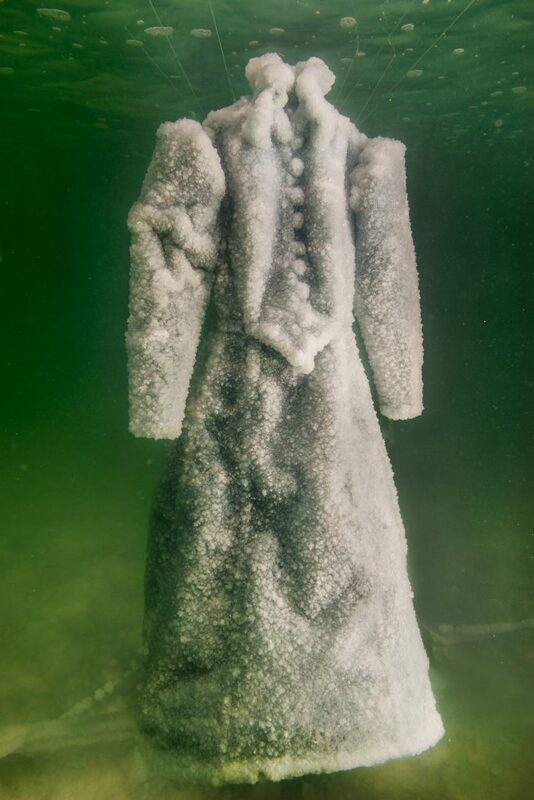 Sigalit Landau, Salt Crystal Bride Gown III, 2014, Colour Print, 163 x 109 cm, Courtesy the artist and Marlborough Contemporary, London. Photo: Studio Sigalit Landau. Sigalit Landau, Salt Crystal Bride Gown IV, 2014, Colour Print, 163 x 109 cm, Courtesy the artist and Marlborough Contemporary, London. Photo: Studio Sigalit Landau. 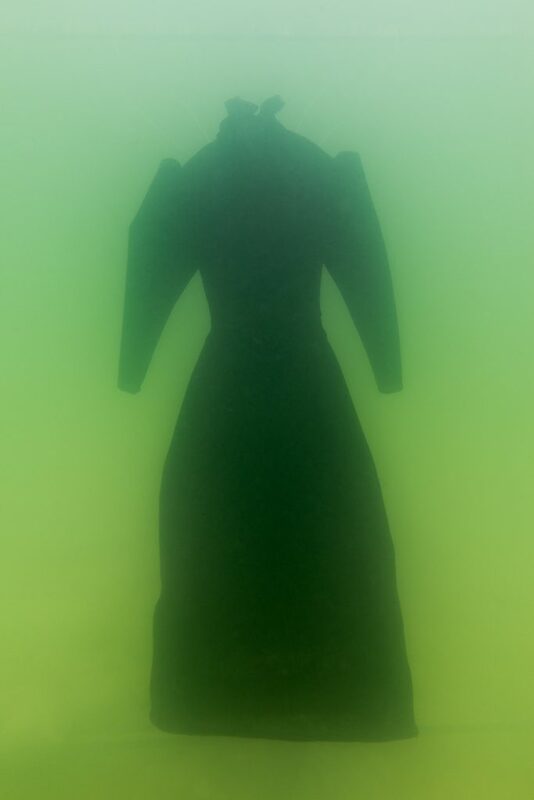 Sigalit Landau, Salt Crystal Bride Gown V, 2014, Colour Print, 163 x 109 cm, Courtesy the artist and Marlborough Contemporary, London. Photo: Studio Sigalit Landau. Sigalit Landau, Salt Crystal Bride Gown VII, 2014, Colour Print, 163 x 109 cm, Courtesy the artist and Marlborough Contemporary, London. Photo: Studio Sigalit Landau.